These Chips had a greasy crunch. 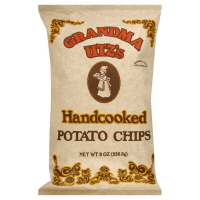 They were an improvement of Utz's regular Chips and the crunch lasted longer. They were almost Kettle Cooked in their texture and crunch. These Chips seemed more flavorful than the other plain varieties n the Utz range. It appears like they are cooked in lard, just like the good old days. Question: Why is the obesity problem higher now than ever before when so much of the bad food we all eat have new and improved healthier recipes? These do however have a bit too much saturated fat, but they certainly tasted natural. A taste of past Potato Chips.